One of the last demonstrations that I did for my classes this year was homemade pizza dough. It is really easy to make and my students were in awe! I use my Kitchen Aid mixer with the dough hook, but the dough can be made in a food processor or using the dough cycle on a bread machine. All three work well. You can also make the dough by hand, but it will take a little more work. Once you make a homemade crust you’ll never go back. It is wonderful!!!! Here are two of my favorite homemade sauces that are great. This one is made with tomato puree and this one is made with canned tomatoes. They both make enough for two 24-inch pizzas. The sauce freezes well so you can have a stash ready anytime you feel the need for pizza. There are many types of yeast. I like using Active Dry Yeast which is dissolved in warm water first when using my mixer to make dough. Be sure that the water is about 115 degrees. If water is over 120 degrees it will kill the yeast. Use a thermometer if you are unsure of the temperature. Better safe than sorry. I have killed my share of yeast. Next it is important to use the correct type of flour. Do not use all purpose flour! Use a bread flour or a high gluten flour. I love King Arthur’s which can be ordered here on line. Most times I just use White Lily Bread Flour. Practice makes perfect so don’t get discouraged if your crust is not perfect the first time. I really do love this recipe that came with my pizza pan I bought a hundred years ago. Now I use the same recipe and bake my pizza on a stone. Speaking of pizza stones here is a trick that I did for my classes because we don’t have a stone. I turned a cookie sheet upside down and heated it in a 550 degree oven. It worked beautifully. So start a new tradition at home and make your own dough. It is well worth it. Add oil, flour, salt, and sugar. Using a dough hook knead dough for about 5 minutes or until smooth and elastic. It will form a nice ball. Place in a well greased bowl. Flip dough over and place smooth side up. Cover with plastic wrap, then a towel. 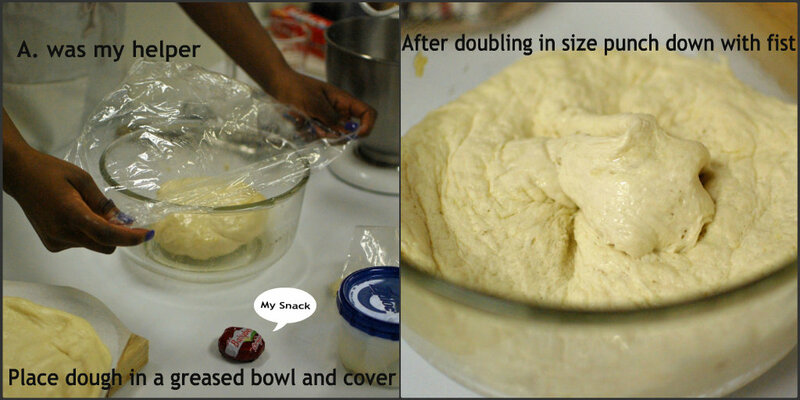 Let dough rise until double in size which will be about 2 hours depending on the temperature of the room. On a warm day I let the dough rise just on top of the range. If the room is cool, turn the oven light on and sit the bowl of dough on a rack in the oven. Punch down the dough with your fist. At this point it can be refrigerated in a plastic bag for 48 hours or frozen for up to a month or just go ahead and make your crust. Preheat oven to 550 degrees for an hour using a pizza stone and 30 minutes using a cookie sheet. 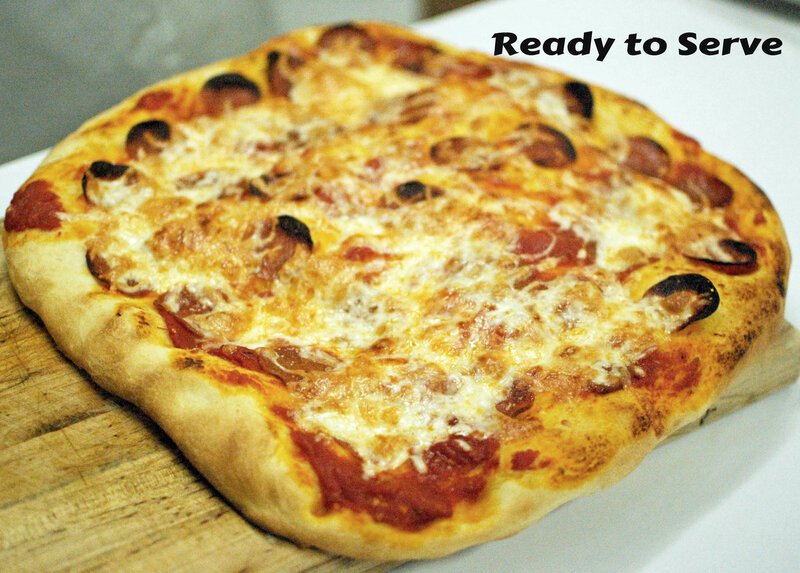 Place the dough on a piece of parchment paper the size of the stone or the cookie sheet that you are baking the pizza on. No kneading or folding of the dough is required, just pushing and stretching. Don’t use a rolling pin. 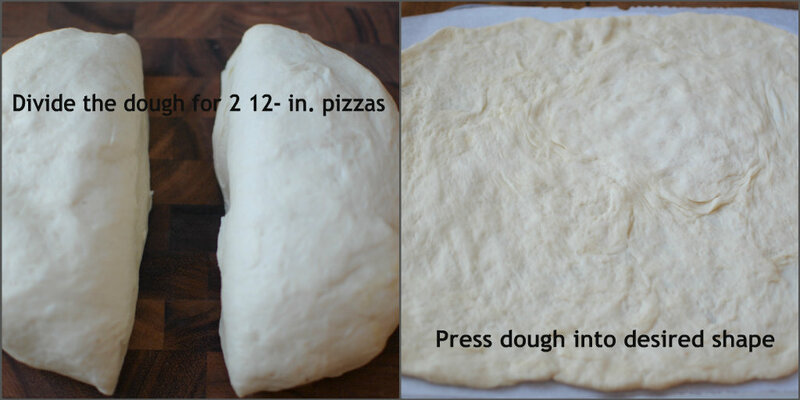 Press the dough into a circle or rectangle. The shape does not matter. Hold the dough in front of you as if it were a steering wheel with both hands. 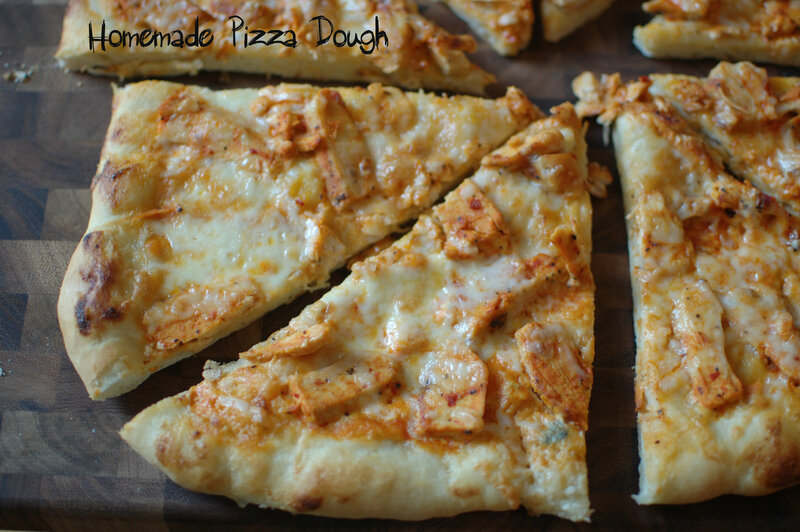 Let your hands travel all around the edge of the dough stretching it as it falls a little. When you have just about the right size for the stone or baking sheet place it on the parchment paper. Place the parchment paper on a shovel or whatever you’re using to push the pizza on the stone. Keep working with the dough to stretch to the desired size . If you make a hole in the dough just pinch it together. 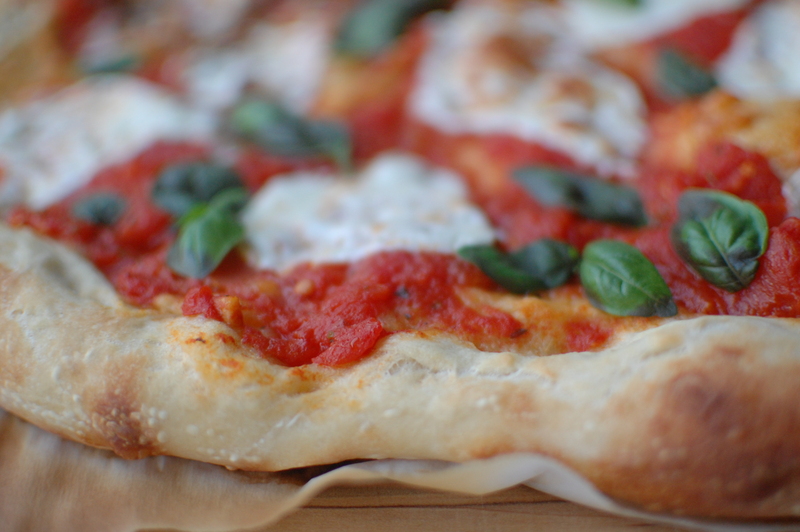 Place a thin layer of your favorite sauce on the dough. Here is one made with tomato puree and one I especially love using canned tomatoes. Don’t use a heavy hand with the sauce. Lots of sauce and toppings will weigh the dough down and make it gummy and not light and airy as it should be. Top with your favorite toppings. Don’t use pre-shredded cheese. There is an additive that inhibits the melting of the cheese. Again don’t weigh it down with toppings! I use a pizza shovel and shake the pizza on the stone. A cookie sheet with no rim can be used. Cook for 8 – 10 minutes. Check the bottom for a light brown crust. what is ” a dough hook knead dough ” ? If water is over 120 degrees it will kill the yeast. : I learned that you can’t use all-purpose flour to make pizza dough. make sure you punch down the yeast then it will rise to much. don’t use a rolling pin. I learned that you have to let the pizza dough rise for at least 10 minutes. I learned yeast is a living thing. put the dough in a warm area so that it can rise quicker. if you make a hole in the dough while stretching it to size, you just have to pinch it back together in order to fix it. If there is water in the dough over 120 degrees then it will kill the yeast. I learned that the pizza dough will rise with yeast. Don’t let your dough rise too long. If the water is over 120 degrees it will kill the yeast. 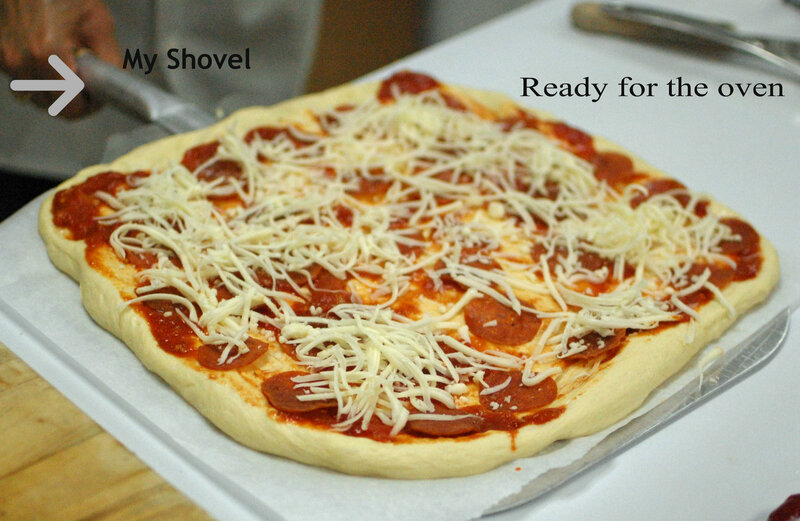 pizza shovels make it a lot easier to put the pizza in the oven as well as taking it out.